What if...? It’s a question many legal experts, technologists, philosophers, and economists ask as they ponder the future. E. Glen Weyl, a Principal Researcher at Microsoft Research, New England, draws on all of these disciplines to radically re-think traditional market dynamics and consider new possibilities. The goal is lofty: To reorganize societies to reduce inequality, increase productivity, and ease political tensions. Weyl, also a visiting Research Scholar at Yale University’s economics department and law school, where he teaches a joint economics-computer science course, Designing the Digital Economy, offered a sampling of what he called “thought experiments” about the future, at a MIT IDE seminar on March 7. Carrying the idea beyond property, Weyl says, we have to “change the narrative” and consider new visions for social transformation. “If we don’t supply an alternative vision, we run risks…and a dramatic rise in inequality.” For instance, labor’s share of the economy is declining, while there’s huge growth in the stock market. At the same time, productivity and economic growth are stagnating. Weyl argues that we can no longer accept the tradeoff of inequality for dynamic markets, which is also triggering today’s “political crisis” and populous movements around the world. 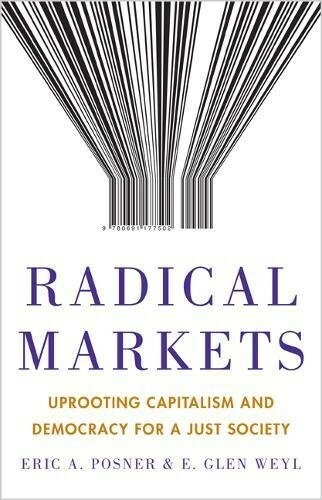 In the book, Radical Markets: Uprooting Capitalism and Democracy for a Just Society, due out in May, Weyl and co-author, University of Chicago law professor Eric Posner, present five “bold ideas” to address inequality, low growth rates, and increased instability. Besides redistribution of property and quadratic voting, they suggest an immigration system based on worker sponsorship, revamped antitrust laws, and a move toward data-as-labor instead of viewing data as capital. The last idea was the prime focus of Weyl’s IDE talk. Essentially, it speaks to the current “anxiety over the decline of labor force participation and loss of jobs to AI in the future.” In Weyl’s view, one reason labor is losing out is that online users aren’t compensated monetarily for their contributions. In the form of online crowdsourcing, this participation model is a new phenomenon, but it also harkens back to the days of feudalism where peasants had no incentive to work because they received no compensation, he says. To avoid “techno-feudalism,” Weyl says the economy has to accommodate and compensate workers for the data they provide online and the tasks they perform. Unlike a flat rate or universal basic income formula, this compensation would instead be in proportion to their contributions to the digital economy. In this reimagined environment, people would receive a wage or payment based on their direct value contributed, which should offset feelings of alienation and provide dignity and pride in the new work they can offer. What if AI were viewed as a productivity enhancement, “and offered new opportunities to earn wages and add to the GDP?” Such a vision, Weyl says, could result in a society where more people benefit from the online economy and the online economy would benefit, as well. Read more about Weyl’s research here and watch video of the seminar here. Many blame today's economic inequality, stagnation, and political instability on the free market. The solution is to rein in the market, right? Radical Markets turns this thinking--and pretty much all conventional thinking about markets, both for and against―on its head. The book reveals bold new ways to organize markets for the good of everyone. It shows how the emancipatory force of genuinely open, free, and competitive markets can reawaken the dormant nineteenth-century spirit of liberal reform and lead to greater equality, prosperity, and cooperation.